***I received the following product as part of the Luma Comfort Brew Crew blogger ambassadorship program. All opinions and images contained below are copyright Momma Told Me Blog 2014. Momma Told Me: It's not pretty, but it's functional. Growing up we had a very ugly appliance that was a staple in our condominium- it was an off brown color, hard textured plastic, and reminded me of my training potty in shape and stature. It sat on Momma's nightstand, on my bedroom dresser when I was sick with the flu, and even on the living room coffee table during especially dry Southern California months (which there are many of.) Humidity, and the lack of moisture in Southern California (valley) air was big issue for my family. As a child my skin and lungs were prone to various dehydration conditions and Momma, recently in remission from a battle with cancer that had claimed a large portion of her lung capacity, struggled to breathe on most dry hot days. As a tween my family later moved towards the ocean for a more humid climate; but the memories of that hauntingly ugly, and loud, humidifier, still remain. Unpacking our Luma Comfort HC12W Cool Mist Humidifier was simple- the base houses the actual mechanical portion of the unit, while the tank is houses in the secondary (middle) portion, and 3 varying lengths of flute are provided to help alter the height of humidity distribution. The unit is cleverly designed to look like a modern vase for discreet decor integration and all pieces snap on top of one another. We did have some trouble visually getting the seams to disappear on a few pieces, but found the parts eased into one another over time and use. The generous 2.5 gallon tank can treat up to 650 sq feet for up to 45 continuous hours on the lowest of the 8 intensity settings. The HC12W's thoughtful design doesn't stop with a sleek exterior and space saving vase inspired footprint- design is a key element throughout the unit's operation. 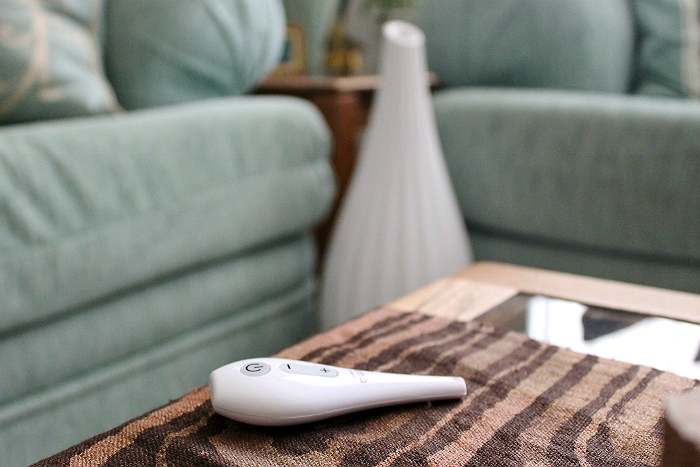 The unit may be turned on or off via a touch sensitive button located on the front, and remote operation allows the owner to adjust the intensity of humidification via the light weight 'drop' shaped remote. The Luma Comfort HC12W offers visual and audio cues to help indicate the tank's status and the coll mist humidifier's operation level (one of eight.) I was tickled to discover the 'do-rey-me-fa-so-la-te-do' scale like tones of the humidifier's operation. For every level of intensity you go up tone is emitted in the next higher scale, and backwards in tone for decreasing intensity. Check out my Instagram video below! Each of the HC12W's unique flutes offer a different dispersion of humidity through either a narrow neck or internal guides that help break up the flow of the mist's direction.Standing at almost 4', at it's tallest assembly, the highest humidity level rose over 5' in the air and dispersed into the atmosphere well before falling. With several hours use on medium-high we noticed a little moisture in the basin of the unit's collection pan (house internally) and a fine layer on nearby plant's leaves. It certainly wasn't enough to alarm us or pose a damage threat. While my inclination of the design and 650 sq ft treatment capacity, says that the Luma Comfort HC12W cool mist humidifier would be best visually suited by a fire place or high traffic area, this humidifier would be equally great in a master bedroom or nursery. So many modern nurseries are going with a crisp, clean, design and the HC12W would look amazing next to a rocking chair n a chevron rug! Currently the HC12W is sold online through the Luma Comfort website, Amazon, and other fine retailers, so order yours now in time for the holiday season. The brand is always innovating something new in home comfort so also be sure to follow them on Facebook, where they even share seasonal and home living content! What Daughter Says: Great technology doesn't take away from great decor. Don't compromise, choose modern comforts that are practical and stylish. Check out a video of the Luma Comfort HC12W Cool Mist humidifier in action, and enter to win an HC12B (Black) Humidifer of your own! I have to write that my first thought upon seeing the steam was I Dream of Jeannie! 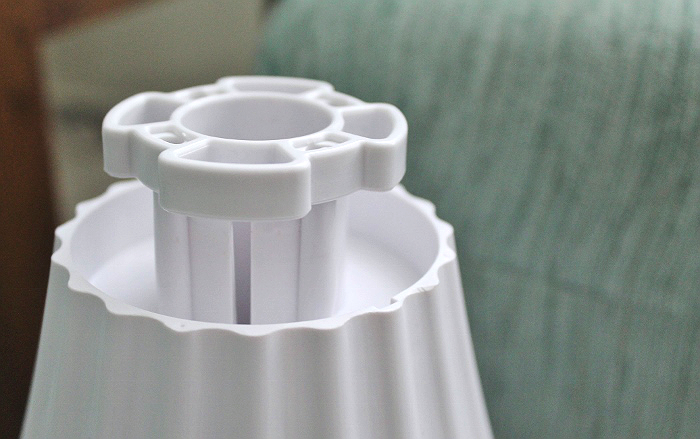 It is a far more attractive design than most humidifiers - that's for sure. They are usually ugly as all get out and this one is not. It's very dry here in Montana too. I agree with you about So Cal air. It is so drying to the nose and skin most of the year. But other than that, we have it great here. This looks like the perfect humidifier for use here. Not too big and looks good too. Okay so I am super mad that my first comment totally didn't count! Anyway....What is the difference between a cold and hot air humidifier? I have been searching for one...but none of them are gorgeous!!! There are two types of cool mist humidifiers- the ultrasonic is the quietest (in general)- additionaly, warm mist can tend to offset the atmosphere's general temperature minutely, as they put off heat to distribute the moisture. This is beautiful! I wish I had it now as I am plugged up and wheezing to boot! Well if that isn't just the coolest!! At first - in the first photo - I could not find the product you were speaking of!! I literally thought that was a vase, or some cool art! Love it! I need this in my life! We use humidifiers all the time because both of my children have asthma. The dry air can be very irritating for them. I love the look of this one; it's almost like a piece of art. It looks like a beautiful vase. I would love this instead of an ugly old one! I'd love to have the AP400 humidifier. But I love the white one that you are giving away. What a beautiful piece it is and would help with my asthma. I love the design of this it looks nothing like a humidifier to me , very modern! I thought this was a beautiful vase you had on the table! With several of us with allergies and asthma this would be perfect for us~! THIS HUMIDIFIER IS A VERY GOOD LOOKING DEVICE. I LIKE TO HAVE IN THE FUTURE YOUR IM200S S ICE MAKER. THANK YOU FOR CHANCE TO WIN. The video needs to be done over so it sounds more than just mumbling in the background! Good thing the product seeks for itself! i like the cool mist evaporator, also. i really like this nice looking humidifier. i didn't know or think about nice looking. i like. I have been looking for a humidifier as it is so dry here and I've been struggling getting a good night's sleep, I would love a chance to win this! I love how sleek this looks. The humidifier I have is clunky. Would love this! I've never owned a humidifier. I really enjoyed this. 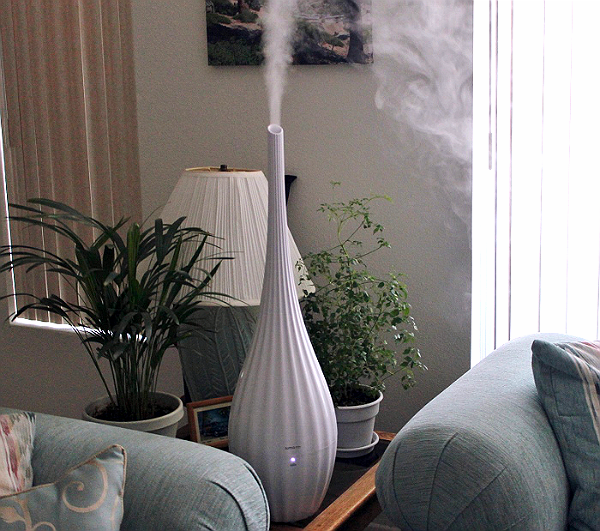 I have ugly, bulky humidifiers and would love this one. My son is 5 months old and since the day he was born he has had a constant stuffy nose our doctor just gave us a referral last week to go see a specialist in Richmond the only thing that the doctor has recommended was a cool mist humidifier I am a single mother so big expenses are hard for me so when I saw this it was like a prayer answered! If we won this it woukd truly be a blessing to my son and I!!! I have a part clear one that sounds like a hairdryer. Love this! In addition to this very attractive humidifier would like to try the Like Comfort HC12B for evaporative cooling.Living in a pretty war NYC apartment with steam heat makes it very important to have a good humidifier for breathing and healthy skin.Also good for my wood furniture. 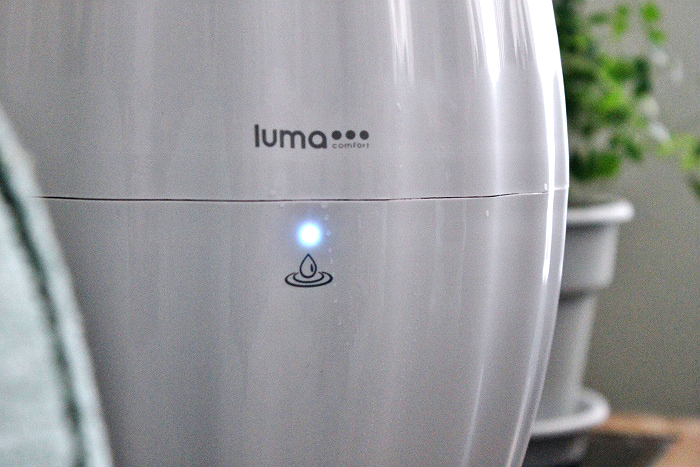 The Luma Comfort HCW10B humidifier is one that I'd like to try out with the options for cool or warm mist. The warm mist is a good option to have to open up my sinuses and the cool mist for when it is just the dry air giving me dry skin. I meant the Lima comfort ec110s as theadditional product I would like to try,evaporative cooling for spring and summer sound good. Would love to win this to help my daughter sleep better at night with better air circulation .. How do I join?. I really like,this de-humidifier.It looks really nice.I could really use this with asthma,copd,empysema,and I had lung cancer.So I really have a hard breathing.They removed the right middle lobe..Thanks for the chance. I actually really just want this humidifier. I love this humidifer and I'm sure my family and our sinus' would love it too.Thanks for the chance and Good Luck everyone! This looks wonderful! I'd love to have one. I love the design of the humidifier. I think it would work well in just about everyone's home. WOULD LOVE THE COOL HUMIDIFIER BUT ALSO THE COOLING MIST FANS WOULD BE SOMETHING I'D LIKE. NEVER SEEN ANYTHING LIKE THESE PRODUCTS. THANKS FOR THE OPPORTUNITY. I would probably buy an air purifier.Have always wanted to try one of these and I am curious as to how well they work. I also would love to win the humidifier. I definitely need humidifier. My skin & sinuses are so dry it hurts. I don't think it's ugly at all. I'd love to win this. I have many skin issues and this would be great for me. I would like to try one of their AIR PURIFIERS. I would love to try their AP400W air purifiers. We live in a very polluted city and it'd be great to have cleaner air indoors at least! http://www.lumacomfort.com/misting-fans/mf26b/ This is amazing it would be so perfect for my home in the summer months I did not know there where fan out there like these I will be passing this along I really think it is terrific. I am so glad to have a chance at this amazing item as well & Happy Holidays to ALL. Mom and I need this humidifier desperately. Our apartment is so dry despite the houseplants. Oh I need this desperately! I have a medical condition that makes me have to steam shower4-5 times a day & this would make it less & oh it is so pretty too. My nose/sinuses would love you guys lol. As I have aged, my eyes and sinuses are so dry. I now need a humidifier to be comfortable inside during winter months. This humidifier is so unexpected looking. It's about time someone thought of a way to integrate this type of convenience into a room without looking like something from a hospital intensive care unit. its beautiful! need one for when the boys are sick. 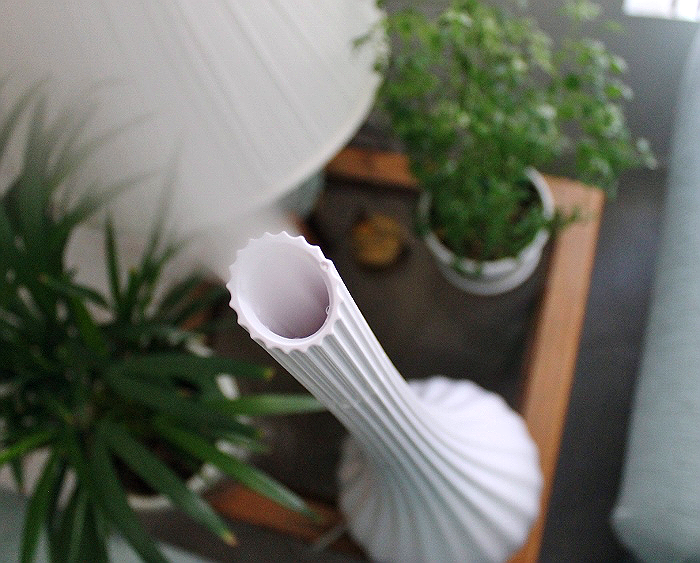 This is a very sleek and stylish humidifier. I could really use this since my sinuses are always dry, giving me many headaches. It would look great in any room of my house and is just what I need. Both my husband and little girl have bad seasonal allergies, so I'd love one of the air purifiers they carry. I'm sure I'd enjoy the fresher air, too :) Lol! I live in New Orleans and it get so darn hot here, sometimes it's unbearable. I would love to have one of the Luma Comfort MF 18W 18" Misting Fans. That misting fan would feel so good on a hot summer day. This is so genius. Finally something to help that looks beautiful. I love this.. would help my dry skin! I love the design. It would likely fit in the decor of any of the rooms in my house. It would be the kind of thing that didn't call attention to it, but also was asked about when it was noticed. I would love to have this in my home, since I have two boys and a husband that are constantly sick with respiratory illnesses throughout the winter. Recently, our cool mist humidifier broke, and since then, my home has been a symphony of sniffles. Getting one of these would not only stop the sniffles, it would make my children, and mommy, able to sleep easier. it is beautiful. i hate the way other humidifers look, but i would love to have this one. we use them all the time in the winter. One other product I'd love to have from the Luma Comfort web site would have to be the MF24B 24" Commercial Misting Fan. This would be an awesome gadget to have in our home and use for events. Their products are all so modern looking. I need this so badly for my younger sister who has severe, chronic eczema. Thanks so much for posting this giveaway! I need one of these for my little granddaughter. I'll tell her its a genie lamp ! I would LOVE one of these!! 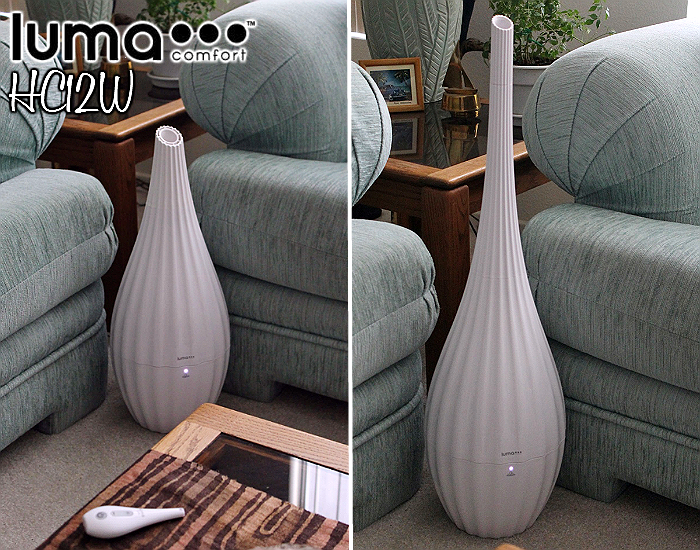 Also, the Luma Air purifier is on my wish list!! I have a 6 month old daughter and these 2 things would be great for the bedroom we share. I would love to have the AP400W air purifier in my home! Our family has both asthma and allergies, so this would be a perfect fix! I would love to have the Luma Comfort IM200SS portable clear ice maker for my home. We use a lot of ice and have to purchase it at the grocery or convenience store frequently. I would love to have the LUMA COMFORT MF18W 18" Misting Fan. I had no idea such things existed. It sure would make my back patio more liveable in the summer. 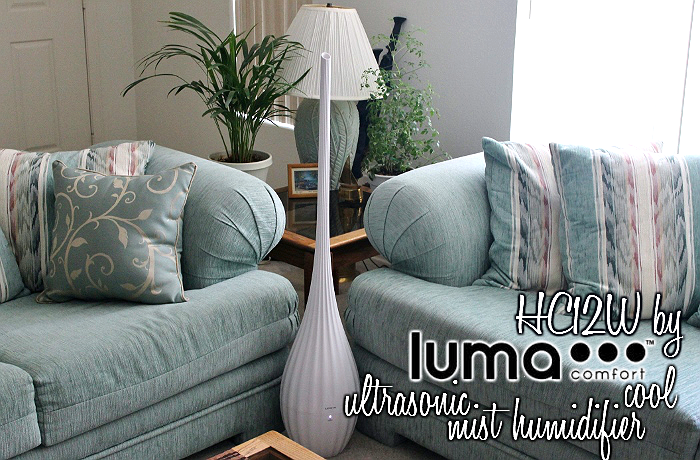 our household could really use the Luma Comfort HCW10B humidifier since it offers cool and warm mist options. it would be really helpful during the cold and flu season. I would love an air purifier, but the evaporative cooler sounds intriguing. It would be great for those in between times when you don't want to turn on the air conditioner. Or when it's not quite hot enough to justify turning it on, but it's still hot! I need a good humidifier so please send me one. I would like to try an air purifier in our apartment to see if it helped our quality of life. The Luma Comfort AP400W looks like it would be a good one. I wouldn't mind a misting fan in my house. It looks really awesome and I'm pretty sure the water would be even more refreshing. I like the ice maker, because ice cube trays are awful! We are constantly buying ice from the convenient store, Having it on hand would be great! would like that,air is so dry. I love this new sleek, design! Very beautiful! I like their portable clear ice maker. This would be absolutely perfect for family gatherings.